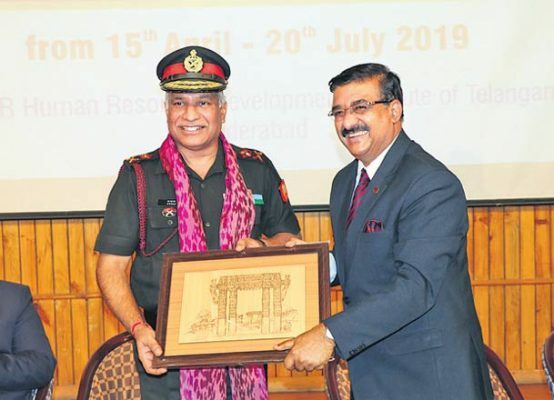 Major Gen. Srinivas Rao said environment-friendly buildings, garnering renewable sources of energy, waste management, and digitalisation of services need to be dovetailed in all future planning. P Acharya, Director General, MCR HRD, presenting a memento to Maj Gen N Srinivas Rao, GOC Telangana & Andhra Sub Area. Hyderabad: Major Gen. N Srinivas Rao, General Officer Commanding (GOC), Telangana & Andhra Sub Area, called upon the Group A officers (Probationers) of Military Engineer Services (MES) to acquire up-to-date knowledge and skills to provide world class infrastructure to the Indian Armed Forces so as to enable them to perform their duties effectively. Addressing the probationers at the inaugural function of the first ever Foundation Course (FC) in the country for Group A officers at Dr MCR HRD Institute on Monday, Major Gen. Srinivas Rao said environment-friendly buildings, garnering renewable sources of energy, waste management, and digitalisation of services need to be dovetailed in all future planning. He advised the probationers to acquire thorough knowledge of project management, operations research and system analysis in order to enrich and diversify their professional acumen. B P Acharya, Special Chief Secretary to Government & Director General, Dr MCR HRD Institute, in his address, said the objective of the FC was to help the probationers develop well-rounded personalities so as to enable them to appreciate the issues relating to their profession in their true and total frame of reference and to emerge as a productive part of the MES. The FC is being attended by 63 probationers from 13 States and is sponsored by the Ministry of Defence.